Spring fishing is magical in the Buffalo Niagara Region. Given it’s the peak fishing period for so many species, the biggest problem we face is deciding which one to chase each outing (that’s a good problem to have). 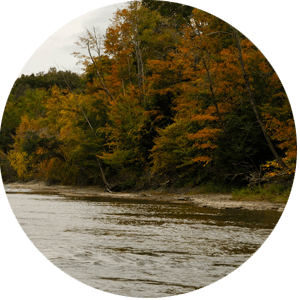 Trout (inland and Great Lakes), Steelhead, Smallmouth Bass, Carp, Northern Pike, and Salmon are all abundant and willing. It makes for tough decisions – choosing one means sacrificing fantastic opportunities for the others. Rest assured that Brookdog staff remains dialed in to the hot bite and can help determine which endeavor will yield the best day on the water. As winter slowly begins to loosen its grip in early spring, the rivers swell with snowmelt and the smaller lakes begin to ice-out. 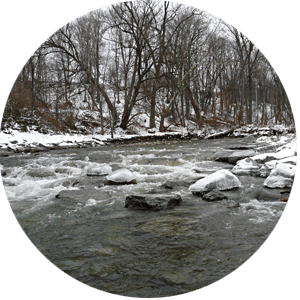 Fresh runs of steelhead enter the tributaries of Lakes Erie and Ontario to join the fish that wintered-over as they ready for the annual spawn. We catch fresh chrome and colored-up fish in solid numbers at this time. 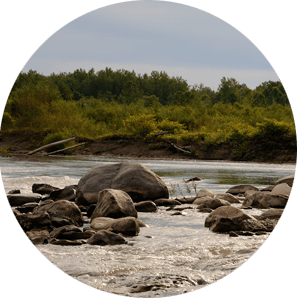 This incredible steelhead fishing holds up well through April and in years with a cool spring and good flows, we often catch drop-back fish well into May on the larger rivers. 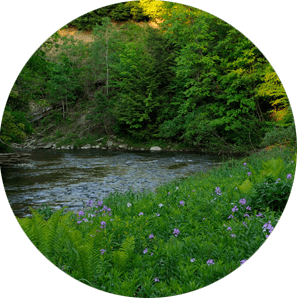 Accompanying the steelhead action of the early spring is our pursuit of giant lake-run brown trout in the tributaries of Lake Ontario as well as their cousins in the inland trout streams – March is WNY’s prime lake run trophy brown trout season. As the Lake Ontario tributaries warm and swell, metabolic rates increase and trophy browns go on the hunt for meat. We target these fish with large articulated streamers fished on sinking tip lines. This exciting style of streamer fishing holds up well through the end of April. As the waters continue to warm through April and May, inland trout fishing in WNY really comes into its own. We enjoy impressive insect hatches beginning with Hendricksons and BWO’s by the third week of April, followed by March Browns, Grey Fox, Sulphurs and various caddis species in May. Some of the most exciting dry fly fishing occurs in early June when the clumsy Green Drakes and stoneflies begin to emerge, causing big trout to look up for an easy meal. WNY rivers explode with life every evening this time of year with hatches of multiple mayfly and caddis species accompanied by the spinner falls of these bugs. The “bug soup” that’s left on the surface turns these serene settings into feeding frenzies that resemble watching a washing machine with the machine door open. Oh yeah, traditional nymphing techniques will take their fair share of fish at this time too. While the insanity ensues on our inland creeks, the smallmouth bass fishing grows to peak as well (we told you deciding where to fish is tough)! It begins with bass entering the lake tributaries as the steelhead are dropping out. We target these huge bass with streamers in shallow creeks just before and after they spawn. This is a time for size and numbers, double-digit days are the norm with some fish surpassing 20″. As the tributary action begins to fade, the smallmouth action in the crystal clear waters of the Niagara River and Lake Erie comes on strong, REAL strong. The bass are in shallow this time of year and there is no better time of year to take advantage of both the numbers and size of fish. Late spring also marks the best carp fishing of the year. Lake Erie and Niagara River carp enjoy a strong forage base and plenty of room to roam resulting in a very healthy carp population. While cruising their likely haunts, you will see large schools with some HUGE specimens among them. Whether roaming the flats on foot or by boat, there are plenty of targets to cast to with chances at some behemoths. Give us a call to experience the best fishing spring has to offer in the Buffalo Niagara Region. Winter, Spring, Summer, or Fall, book a trip with us for the best way to experience every season in Buffalo Niagara.